Forget about rows of desks pointed at a whiteboard. Here's how mobile technology is reshaping teaching and learning. Designing the classroom of the future is no easy task, mostly because it's difficult to know what the future will look like. As little as five years ago, few could have predicted the ubiquity of tablets and their accompanying need for more and more WiFi capabilities. Even the maker movement's reliance on "creative spaces" is a relatively new phenomenon. As quickly as new technologies arise, other devices previously deemed indispensable fall out of favor. Take the interactive whiteboard (IWB), for example. According to J.D. 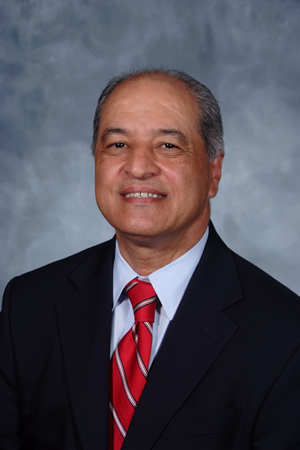 Ferries-Rowe, chief information officer at Brebeuf Jesuit Preparatory School in Indianapolis, the school made a sizable investment in IWBs about a decade ago. These days, Ferries-Rowe can't resist criticizing the boards as inherently "teacher-driven." Ferries-Rowe works closely with Brebeuf Assistant Principal Jen LaMaster, and both are keenly tuned in to 21st century learning. "With interactive boards, teachers are standing there tapping, essentially using it like a chalk board," said LaMaster, with a trace of wistfulness. "It pretends to be interactive, but the most interactive you can be is two kids standing at the board and 18 watching. It's the opposite of an experiential activity." "Interactive boards are on their way out," agreed Sam Farsaii, chief technology officer for the Coppell Independent School District in Dallas. "With inexpensive devices such as tablets, and a projector system, you can simulate whiteboard activities in an even more interactive way." Farsaii pointed out that even the physical height of interactive boards can be problematic, particularly for elementary students. 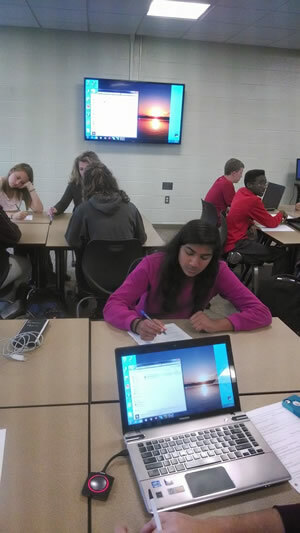 In the interest of cost-effectiveness, Farsaii reported that IWBs will stay in the Coppell district "as long as the products function, to maximize their use," but he and Ferries-Rowe agree that interactive whiteboards are a prime example of how tricky it can be to plan a classroom around any one technology. "I refuse to write a technology plan that goes beyond five years," said Ferries-Rowe. "Anything beyond five years is Star Trek." Erin Klein, a second-grade teacher and technology and design consultant, has a mission to bring flexibility and comfort to learning spaces. Regardless of future technology, she maintains that flexible seating arrangements that allow for easy transitions will serve students today and in the future. "Movement is so important in the classroom, especially at the elementary level," said Klein, who teaches in the Bloomfield Hills area of Michigan. "I have two elementary-aged children of my own, and I know how often they need to transition. My students were telling me that they weren't comfortable, and that it was hard to talk to the person across from them without shouting because of the configuration of the desks. They were so far apart, so I got rid of the desks and asked them how they wanted to sit." 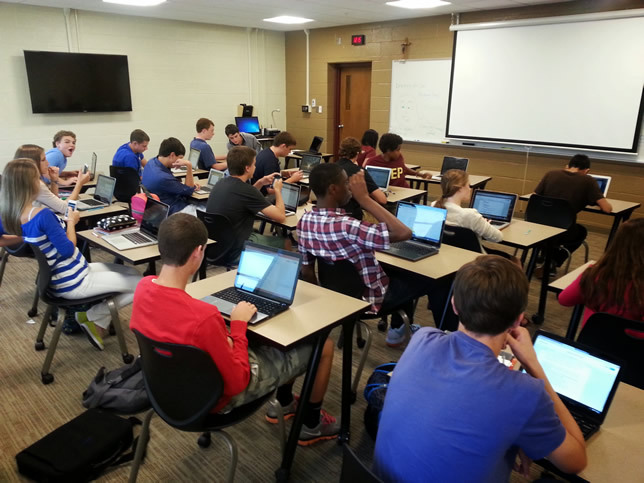 Designing the classroom for students means planning for their future needs, and first and foremost that means open access to the Internet, a feature of the modern classroom that is not likely to go out of style anytime soon. "We need stations to charge multiple devices," said Klein, the reigning MACUL Technology Teacher of the Year for the state of Michigan. "The room needs to be outfitted with a lot of outlets that aren't just for regular plugs, but also for USBs." And planning for a 1-to-1 environment is not enough, she said. "Eventually, it's going to be a 1-to-3 or 1-to-4." With so many students coming to school with smartphones, laptops, tablets and iPods, having a place to display information for small groups will continue to be crucial, whether it's done with an interactive whiteboard, a projector or something yet to be invented. Ferries-Rowe said, "They may come up with something else, but right now I'm intrigued by the projector tables, especially as Windows 8 becomes more mature. I have seen some of the table projectors where a group of kids can be clustered around, moving things around and rearranging things. That is intriguing technology." 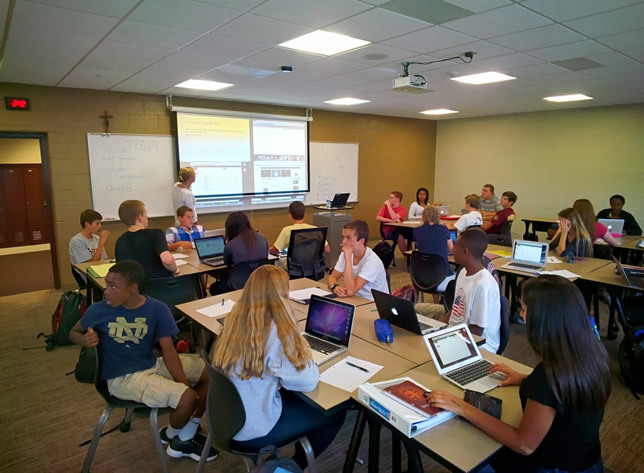 LaMaster added, "We are looking at the idea of collaborative spaces — a mediascape system where students are quickly able to share with students what they are doing." She added, "The combination of the classroom and the cloud becomes more and more important, because it's no longer all of us taking notes. We are using cloud-based documents to take collaborative notes. Final notes are posted. Any technologies that begin to merge cloud and classroom are going to be big in the future — that is why going 'multiscreen' seems to be more important when thinking about future design." Staff members at Brebeuf are renovating parts of the school with an eye toward 3D modeling presentations, and LaMaster and Ferries-Rowe are reviewing everything. "Lighting has come so far," mused Ferries-Rowe. "We get these Philips Hue lights where you can control five different light bulbs with intensity, color and very dim to very bright. What does lighting mean when displaying art? It's something for students to consider as presentations change in the future." The old classroom filled with rows of desks designed to support teacher-centered curriculums may no longer be in vogue, but the old construction remains. With bandwidth requirements escalating, these older buildings can provide a huge obstacle. As Farsaii put it, "These days, wireless is the life blood of schools. Sheetrock and glass can be penetrated, but older buildings have brick and mortar, and getting signal penetration is a big challenge. If you have a historical building, then that becomes almost impossible." Klein explained that the historic schoolhouse where she teaches is aesthetically pleasing, but that the cement walls stifle connectivity. "When we have parents come in for open house, oftentimes it's hard for them to get a signal out of the building," she lamented. To address the issue, she said, "We are currently renovating our entire multimedia lab. Everything that is not a load-bearing wall has been flattened and removed. When construction is complete, she said, "It's going to be a mobile cafe. Children will be able to have laptops, iPads and interactive projectors on the walls. There is going to be a bank of computers on a wall. Most of the children will be able to get their word-processing or Internet on the mobile devices. There is room for a lot of work if districts are willing to be creative." Klein said she believes that creative people are just as important as equipment in designing the classroom of the future, and to her that means full-time employees to provide coaching to teachers. If football requires multiple position coaches, Klein reasons that successfully integrating technology and education requires at least one "coach" per school. "I know a lot of districts are struggling to even create that position, but it's important," she said. "People who are in these coaching-type positions for technology integration are often overwhelmed. There must be opportunities to work with teachers, grade levels or departments in a more meaningful way if you want to shape a state-of-the-art classroom. You can't just say, 'Here's an app or Web site.' Coaches need to collaborate by redesigning the curriculum to support blended learning. And ultimately, I would hope that the term 'blended learning' would disappear, and that it would just be assumed that technology would be integrated." When it comes to PD, LaMaster cautioned administrators against the assumption that younger teachers will pick up all the tech tools they need on their own. "Some people think that anyone under the age of 26 magically knows how to use all this stuff, and use it in an interesting manner, but that has not been my experience," she said. "Give teachers a place to try new things out and ask questions, because these are all new environments…. You can buy all the futuristic equipment you want, but you must provide that help." For Klein, the classroom of the future is only worth creating if it supports the fundamental mission of teaching students. Special needs kids with dyslexia, for example, have already benefitted from technology. "I had a little girl with dyslexia, and it was a challenge for her whenever we were in writing workshop and drafting stories," explained Klein. "She was one of the best oral storytellers, and we often do oral storytelling as a rehearsal method before we put pencil to paper. However, whenever she went to draft her story and actually put that pencil to paper, she would write about two sentences and then get frustrated. But the story has a happy ending. Klein had a LiveScribe Smart Pen, so that as the student wrote and talked out loud, the pen recorded every stroke she made and the audio that corresponded with that stroke. "At 7 years old, she was sketching her ideas out across her five-page story, and she could talk out loud as she was sketching. So it's really encouraging that meta-cognitive processing. She could go back anywhere in her sketch or illustration and touch the given key strokes at the part she was thinking about and hear her audio playback. That allowed her to finish writing her thoughts before they would get lost again." Klein concluded, "Ultimately, you really need to think about the design and layout of your space and how that can support your curriculum, Then you can start thinking about how to outfit your infrastructure and what devices you might need to enhance the curriculum." In August 2014, a brand-new school opened in the Dallas-based Coppell Independent School District, and 30-year veteran Sam Farsaii, chief technology officer at Coppell, had the rare chance to contribute ideas to the school's design. The new school, called Lee Elementary, is a state-of-the-art educational institution designed with the future in mind. THE Journal: What does your new school look like? Farsaii: There are lots of windows, open spaces and flexible spaces that can be rearranged for multiple uses. There are 'wet' areas, as well as dry lab areas even at the elementary level, so students can pursue what they are interested in, simulate or be creative, rather than just be confined to the classroom. THE Journal: What advancements are particularly focused on the future? Farsaii: Lee Elementary is the first elementary green school in Texas, designed with sensitivity to our environment. Solar panels are on top of the school, geothermal wells are underground, as well as systems to collect rain water. These resources will be used to gather data and information so students are basically in a living laboratory. Every day they are tracking the usage of electricity, water consumption, temperature and quality of the air. THE Journal: From a technological standpoint, what are the design elements? Farsaii: It's important to have as many electrical outlets as possible so students can charge their devices. Some outlets actually have integrated USB ports within them. There are portable towers that can recharge multiple USB devices, similar to what you see in the airports. These are flexible in nature and can be retrofitted as technology changes. So today it's USB, tomorrow it might be another port standard. Flexibility is most important, and that is a challenge.